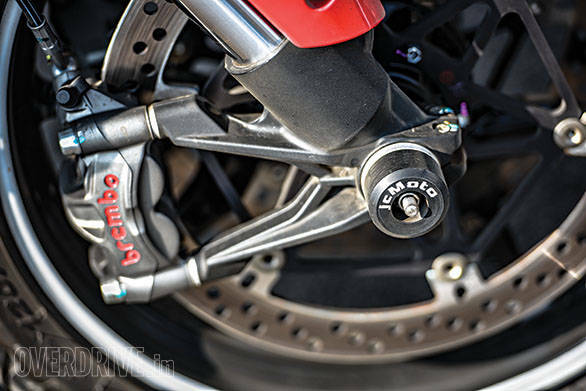 How and why I looked past the Ducati 959 Panigale and purchased a Ducati Multistrada is a long story. But the upshot is that a friend finally decided to let his well-kept 2004 Yamaha YZF-R6 go and I was in the right place at the right time. Buying that sportsbike - to be housed in Bangalore and to be used at the racetrack - allowed me to focus on something that will do everything else - city, highway and perhaps, a little light off-roading. The Multi' popped into my head almost immediately. 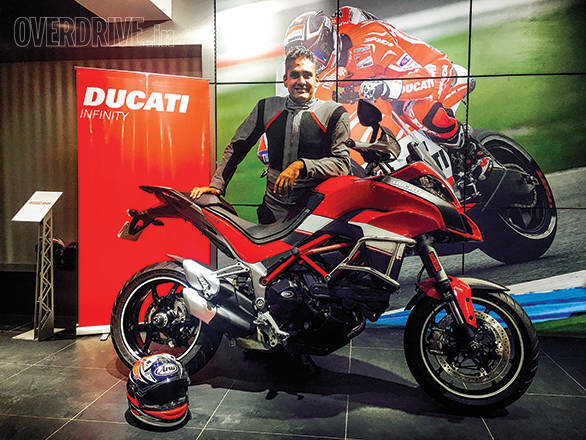 I rode the press bike at the track for the jury round and then around and outside Mumbai over Christmas, and it made my head swim with ability, precision and speed. Then it was just a matter of the money, ahem. A month after that, the Multi, named Feroci, was ready to come home. I'd found it a bit too red for my liking, so I ambled over to Zubinn Designs and they executed a variation on the Pikes Peak theme that I think looks better than the original. The crest on the front is the same but the narrower white stripes on the side and the matte black stripe alleviate the scarlet while making the Multi look just a little smaller. Well, in my head at any rate. I also added a smattering of protection. The standard aluminium bash plate was powder-coated black to match while Performance Racing sold me R&G's oil-cooler, radiator and engine case guards. All in black, they blended in perfectly. My friend Joshua at jcMoto sorted out the crash bobbins - bar-end, frame, both axles. Finally, I ordered the Ducati Performance/Touratech crash bars - they'll be useful in our chaos, I think. It does have niggles, though. A replacement headlight is coming - there's a surface imperfection that shouldn't be there. We also discovered a pinched brake cable that appears to be a cosmetic imperfection and this will also be replaced. The worrying one is a gentle 1-2 degree play in the rear shock. 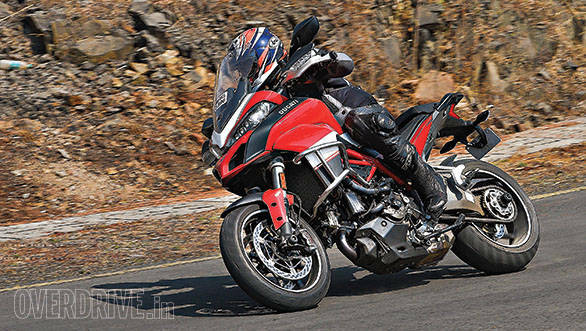 The forums say it happens to the Skyhook suspension Ducatis, thanks to a spherical mount, but the demo Multi' in Mumbai doesn't have any play. In any case, while many Multis with this are certified OK globally, a couple have empirically had their shocks replaced. So we shall see how this will pan out. 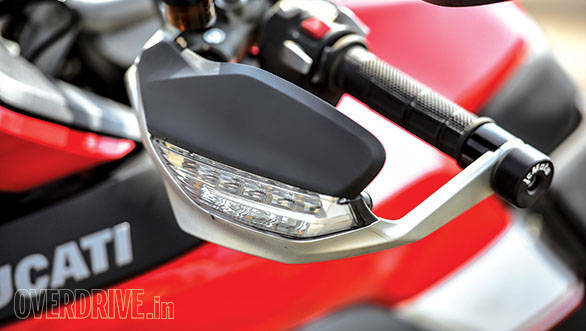 But despite the niggles, the Multistrada is a gobsmackingly good motorcycle in our conditions. I did the initial miles in Touring mode because Sport mode felt a little too stiff for our conditions. The difference when you switch modes is dramatic and satisfying. But I've discovered since that Urban mode is even more plush and I've set the engine response to the same as the Touring mode and it flows. Whether you're caning it or wafting about, the Feroci knows exactly what to do. It's spookily good and I mean that in a good way. I wish Mumbai would keep up though. Because the concrete roads and the Multistrada make for a cheeky partnership. 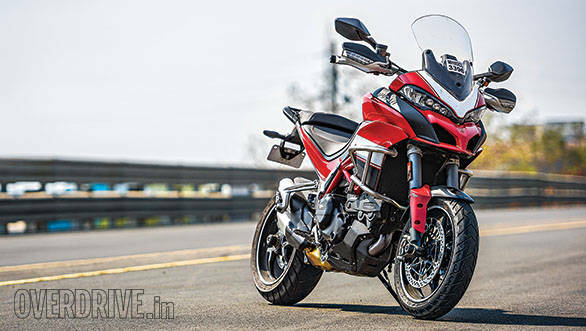 The concrete is like Teflon and the Multistrada struggles to lay the power down. What happens most often is that traction control or wheelie control has to reign the torque in. In Touring and Sport mode, this means hilarious powerslides at will which the traction control allows for a beat or two before the twin yellow lights flash and bring it back to you. I also turned back wheelie control and that has helped - the stutter of wheelie control arresting an imminent wheelie has been replaced with a much smooth throttle-wheel connection even if there is sometimes an inch or two of air under the front wheel now and then. At 300km in, I went in for my usual early oil and oil filter change and that went well although the oil contained a surprisingly low amount of swarf. The hit? Rs 5,780, which is only Rs 280 more than I paid on the Triumph Street Triple. So far so good! But that said, riding with hard acceleration and no sustained speeds for the run-in means I've managed to hit reserve in 180-190km which sounds low. I expect that post first service when I start to ride more normally, the economy will jump quite a bit and the 300km tank range the 20-litre tank is supposed to deliver out on the highway will show itself. Final words? An initial plan to add auxiliary lights to Feroci has been shelved. The LED headlights are absolutely superb in low- and high-beam, and the brightness as well as effectiveness is insanely good. The ride so far has been eye-openingly good and I cannot wait to locate opportunities to take the Ducati out into the wilds. Stay tuned.